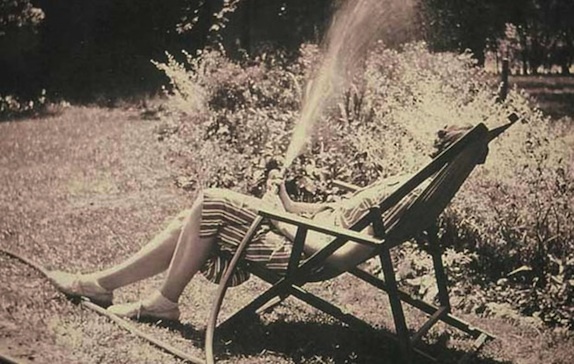 Eudora Welty. Photograph by Jill Krementz. There are certain towns that are forever linked with the authors who lived there. Oxford, Mississippi, is Faulkner land, parts of New Orleans’s Toulouse Street belong irrevocably to Tennessee Williams, and Monroeville, Alabama, is Harper Lee’s territory as surely as if it had been marked on the state map. 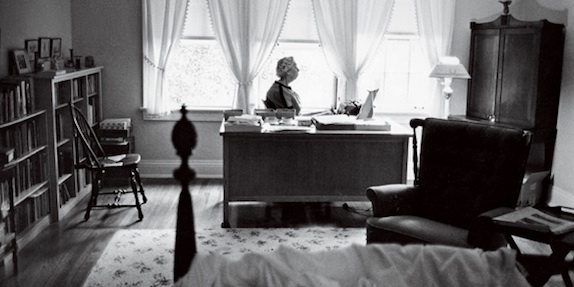 If Jackson, Mississippi, had a patron saint, it would be Eudora Welty. Author’s homes on public display tend to have a stuffy quality, all velvet ropes and militantly made beds. The assiduousness of the preservation drains the life from them, makes them seem impossibly antique. Welty’s house, a Tudor-style revival tucked into a thicket of pines, is almost unbearably welcoming. Visiting feels like an intrusion on her privacy. The rooms are littered with paintings and clever bric-a-brac—a gaudy bust of Shakespeare on the mantel, a gold heart-shaped box inscribed with “The Ponder Heart” on a living room table. Her many accolades are nowhere in sight, removed from the house and put in a small museum adjacent, since Welty had a habit of keeping them in a cardboard box tucked in the upstairs closet. 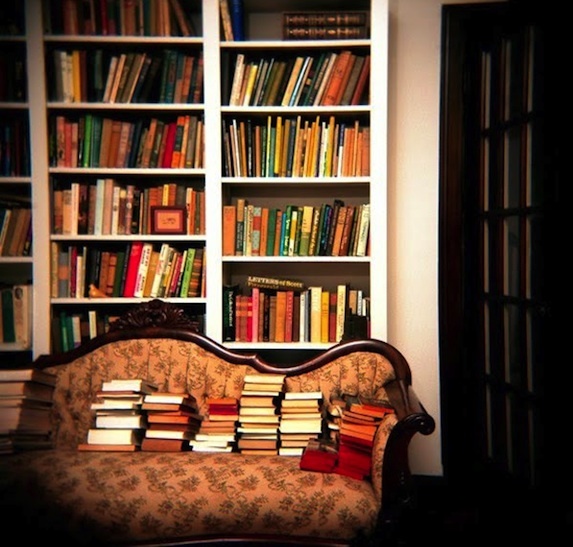 Piles of books cram into shelves in almost every room and teeter in piles on most surfaces: dictionaries, collections of Greek myths, novels by Wodehouse, Thurber, O’Connor, and Pritchett. Her nieces used to complain that when they visited Eudora, they had to move a stack of books just to sit down. But Welty is not a regional writer—her purview is much smaller than that. Her writing is bound up in the romance of everyday objects, in the vagaries of memory and how they become tied to a place, a room, a piece of furniture, or a trinket. Proust had his madeleine, but Welty had pralines. In her house, certain objects give you literary déjà vu. There is the desk from The Optimist’s Daughter in her bedroom, every slot filled with letters. There are the volumes of Dickens from One Writer’s Beginnings, mud-spattered from when her mother threw them out of the window to save them from a fire. It is disorienting to see these objects outside of the page. Life intertwines with fiction for most writers, but it’s rare to be able to point to the exact intersection. By the nineties, the magnificent garden had fallen into disrepair, Chestina long gone and Welty too consumed with other activities to preserve it. Before Welty died, she authorized the state of Mississippi, led by preservationist and gardener Susan Haltom, to restore the garden to its former glory. The work, which Haltom documented with writer Jane Roy Brown and photographer Langdon Clay in the book One Writer’s Garden, was painstaking. The main guidelines for the restoration team were passages from Welty’s letters and fiction. The result is a multiroomed affair, a map of larkspurs, Johnny-jump-ups, roses, verbena, Russian sage, and daylilies corralled into islands and fjords. Walking through, Welty’s descriptions ring in your head. There is the althea bush like the one in Losing Battles, full of flowers “pink as children’s faces.” There is the Silver Moon plant the yard boy attends to in “A Curtain of Green.” The tiny agonies and triumphs that are the sustenance of Welty’s work are all entangled in nature. The first time I visited Eudora Welty’s garden was shortly after my parents moved to Jackson, while I was in college. I had been abroad in India the whole summer as they had boxed up my childhood home in Birmingham, shipped the possessions four hours south and west into the sleepy expanse of Mississippi. When I arrived at their new house, I felt disoriented: Jackson was like Birmingham in many ways, but smudged somehow, the drawl a little deeper and the backyard clay tinged yellow instead of red. I concerned myself with rearranging familiar books on foreign shelves, taking short trips around the town to see the old capitol building, the fairgrounds, the local bookstore where a bust of Welty sits festooned with mardi gras beads. Margaret Eby is a freelance writer living in Brooklyn.